If you were told at the Christmas Eve lows for stocks that equities would have a monster move into 2019, and that we would go through the longest government shut down in history, what would you say? Recent history is a great reminder that the future always seems to make less sense in outcome than in story. The future is always full of surprises, and no amount of intelligence or data can ever fully prepare you for the unknown. Asset classes once thought dead live again. Bull markets once thought over, resume. Strategies once thought broken, come right back. We can never know the exact reason why except with hindsight, making those surprises seem like they never were. The reality is that big money tends to be made betting on areas no one else thinks can surprise. I think the biggest surprise here may be that China has a monster 2019, completely undoing the 2018 bear market, independent of whether a deal is made or not with the Trump administration. 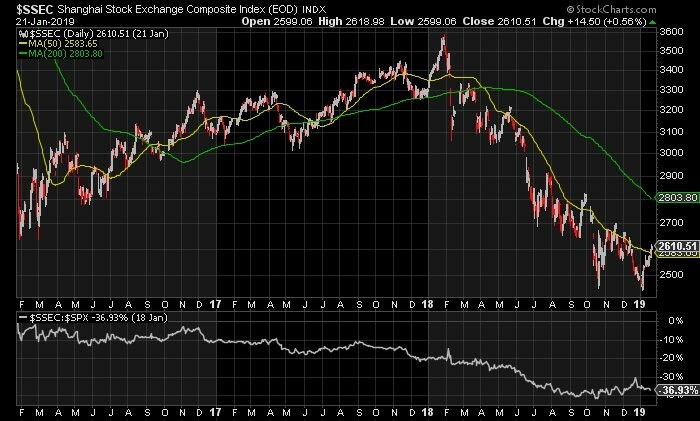 Looking at the Shanghai Composite, we may be seeing signs of a “double bottom” and trend reversal taking shape. What is remarkable to me about the slowdown arguments for China is that they’ve been known for a while. Markets are supposed to be a discounting mechanism of an ever-changing future. With negativity and bearishness still high on foreign equities, the irony would be that the third year of a presidential cycle, which historically is a good one for US stocks, may be an incredible one for China. I’m not as excited about US markets broadly this year, though on any given series of weeks domestic equities could certainly be strong. I am much more intrigued by the potential for reflation kicking back in and being a driver of global cyclical plays. I know everyone is still panicking about the yield curve, but when looking at the spread between short and long-term rates, the contrarian in me would say this is a buy around these levels. If you think so too, that implies you believe the yield curve will steepen this year, bringing with it global optimism for a re-acceleration of growth. Of course, there is no way to know how this year plays out until Dec. 31st. For us, it largely doesn’t matter. Our ATAC strategies are short-term in nature, rotating based on weekly signals in a highly tactical way. But for more traditional asset allocators, it could very well be that any kind of “deal” with China made by Trump actually benefits China’s investors the most.